The management buyout team aiming to take over Birmingham-based van maker LDV has said it believes the firm has "a viable long-term future". Erik Eberhardson, head of the buyout team, made the comments following a "long and constructive meeting" with Business Minister Ian Pearson. His statement comes a day after the government said it would not meet the firm's request for an urgent £30m loan. Mr Eberhardson said efforts to secure the necessary funds would continue. 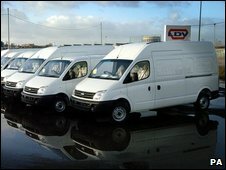 LDV has suspended production since December because of falling sales, and has admitted it has not made a profit for four years. The firm is currently owned by Russian company Gaz, of which Mr Eberhardson is the outgoing chairman. LDV currently employs 850 people. Gaz is controlled by oligarch Oleg Deripaska, a friend of Business Secretary Lord Mandelson. The management buy-out team aims to make LDV the first big producer of electric vans in the UK.